There is a need to transform legacy platforms to digital platforms to achieve sustainable competitive advantage into the future. The Connected Enterprise is portrayed as a gateway to the digital transformation; it allows all enterprise levels and networks to converge together and securely connects people, operations and technologies. With the Connected Enterprise, it is possible to have full visibility into the organisation processes, data and analytics enable better and faster decision making, this seamless connectivity fosters new collaboration. Furthermore, operational intelligence is levered, by having access to real-time data to analyse and make better and faster decisions. Additionally, connected systems redefine productivity with advanced integration. Moreover, all combined: the connectivity, the visibility and the traceability allow better risk management and more secure systems and operations. 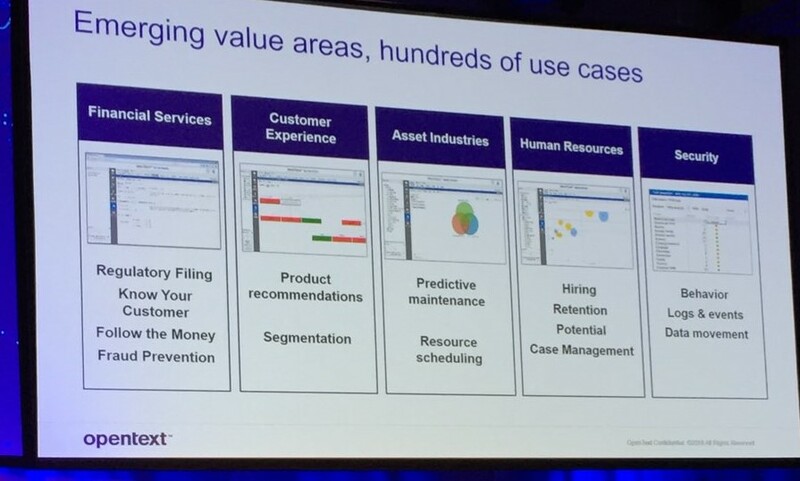 To materialise the Intelligent and Connected Enterprise concept, it is critical to have other two on the agenda: Security and Analytics. Information is power at the same time it is vulnerable to attacks, companies should assume that "bad players" or hackers are all around. For this reason, security is crucial and needs to be implemented from inside and outside, while at the same time protect endpoints. It is time for Security 360°, where all the stakeholders need to commit to it and play a key role from their position, because not only the data is vulnerable, people behind the information are exposed to security breaches as well. By implementing an integrated security system, from the data to the people, situations such as the Facebook-Cambridge Analytica could be prevented. 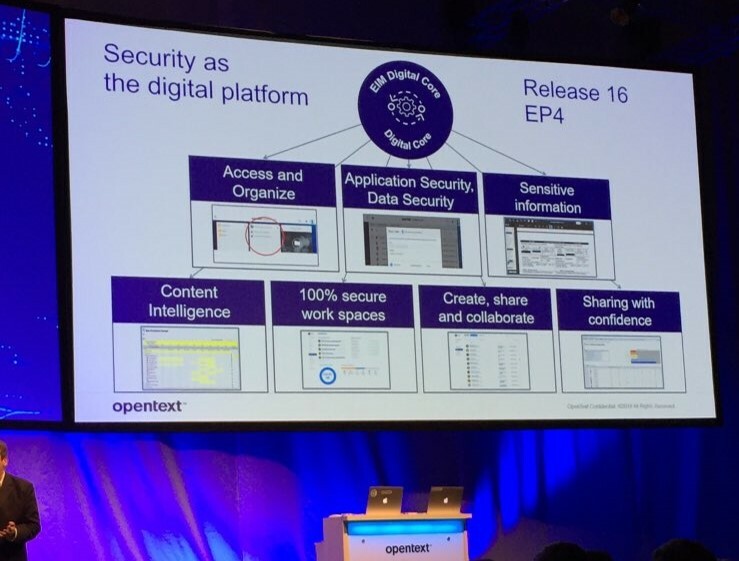 OpenText stated that security is a primary task for them, this detailed attention to security issues had led to enrichment with security features in different areas of the EIM software. According to this, OpenText offers more than 1,000 new security-related features in the Enterprise Information Management package "OpenText Release 16 EP4", on which the company worked for the past year. The recently acquired security company Guidance Software incorporated a lot of know-how included in this new package, which at the same time improving security in information distribution, applications, data management, endpoint and e-discovery, the latter incorporation with Recommind, now part of OpenText. For example, according to Barrenechea, OpenText's new e-discovery technology enabled a customer to filter out originally 48 million pages of unstructured data into 142 relevant pages for editing. In an interview with Otto Gies, VP Technology of Airbus, Barrenechea discussed ways to save on maintenance issues through Artificial Intelligence - AI. The AI technology allows companies to face the Data-Driven operations by providing added value to different areas in numerous use cases. The integrated use of AI and analytics is the key to achieving a truly sustainable competitive advantage in the digital era. The AI platform "Magellan" itself was a topic that was discussed in more detail during the keynotes and lectures. Having launched the service last year, OpenText has now designed around 100 sample applications. The new platform will allow companies to have better insights regarding their processes and people, enhancing efficiency and productivity. With the AI technology, it is possible to transfer added value through all the company levels from the inside to the outside, and finally the end-users. It will allow addressing digital challenges across different businesses in several industries. 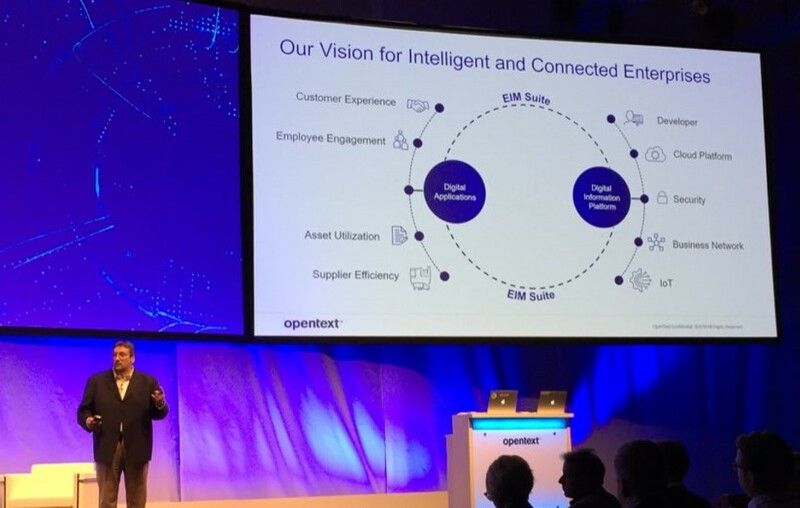 For OpenText, user experience (UX) matter. 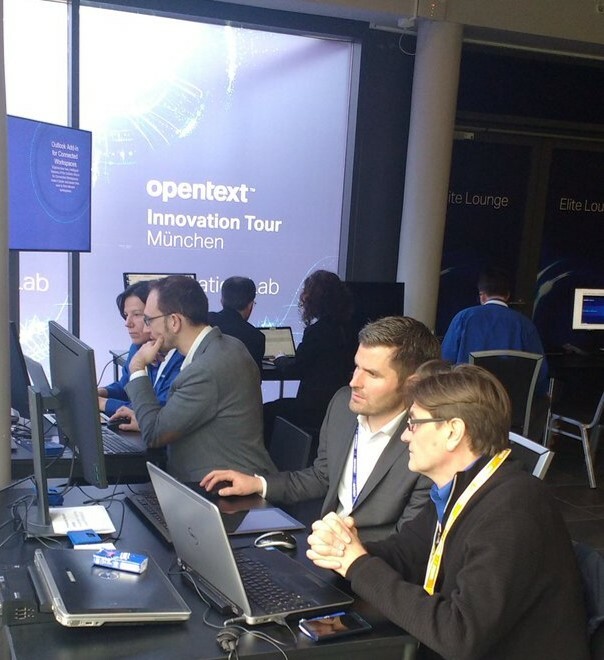 At the Munich Innovation Tour, the Innovation Lab allowed users to interact with the technologies through hands-on experience to directly influence product development. The UX involved listening carefully to customers and putting their feedback into action in an on-going innovation and improvement. The Innovation Lab ran customer feedback session, by taking part in a 20-minute usability test. Learn more about the Innovation Lab! Additionally, GDPR strategies where presented, emphasising on the importance of identifying how do users and organisations see GDPR and its impacts on the business itself, to finally come across the next steps and the specific OpenText GDPR solutions. To sum up the Innovation Tour 2018: the importance of the right use of data, Security 360°, the data analytics insights through AI to understand our customers and their behaviour. The Innovation Tour is a technological prelude to the Enterprise World 2018 in July, Canada, where more updates will be presented. We KineMatik, as an OpenText Partner, are looking forward to it! Scroll down to see our gallery and let us know your favourite moments of the Innovation Tour 2018 on Twitter and LinkedIn!